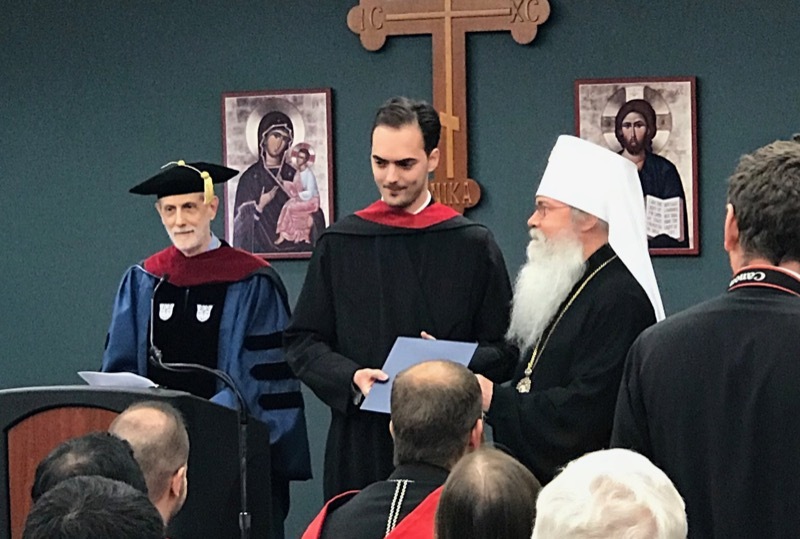 At its Commencement Ceremonies Saturday, May 19, St. Vladimir's Orthodox Theological Seminary (SVOTS) conferred degrees upon twenty graduates, including thirteen Master of Divinity, five Master of Arts, and two Master of Theology students, and also awarded three honorary doctorates. On Saturday morning, His Beatitude the Most Blessed Tikhon, Archbishop of Washington and Metropolitan of All America and Canada of the Orthodox Church in America (OCA), presided at Divine Liturgy at Three Hierarchs Chapel. He was joined by clergy from among the student body, faculty, and Board of Trustees. Commencement began at the Metropolitan Philip Auditorium following the Divine Liturgy, lunch, and a Prayer Service. Among the many distinguished guests were two representatives of St. Nersess Armenian Seminary leadership: Bishop-Elect and Alumnus Very Rev. Daniel Findikyan, who was recently elected primate of the Eastern Diocese of the Armenian Church of America, and Priest Mardiros Chevian, the Dean of St. Nersess. Their presence was particularly meaningful at this Commencement, as 2018 marks the fiftieth year of cooperation between St. Vladimir’s and St. Nersess Seminaries. Additionally, at the 2018 ceremonies graduating seminarian Timothy Aznavourian became the first Armenian student chosen to deliver the Salutatory Address at a SVOTS commencement. The Commencement Address was delivered by Dr. David Bradshaw, chair of the Department of Philosophy at the University of Kentucky. He spoke to the graduating class of the need to share, in particular, three beautiful aspects of Orthodox Christianity still largely unknown or misunderstood in the secular world: Orthodox worship, the wisdom and example of saints and monasticism, and forgiveness. Dr. Bradshaw was also one of three people who received honorary doctorates at the 2018 Commencement. St. Vladimir’s Seminary conferred the honorary doctorates to Dr. Bradshaw, composer Mitered Archpriest Sergei Glagolev, and Seminary Trustee Emeritus Protodeacon Peter Danilchick for their outstanding contributions to the Orthodox Church. Following Dr. Bradshaw’s address and the conferral of degrees, graduate Dimitrios Nikiforos delivered the Valedictory Address. Student Council President Angelo Niqula then presented the St. Macrina Award for Excellence in Teaching, selected each year by student vote, to SVOTS Director of Music Robin Freeman. Graduate Stefan Djoric, a student of the Diocese of Eastern America of the Serbian Orthodox Church, recounted his experience at SVOTS by noting: “As a student of St. Vladimir’s Seminary, I had an extraordinary experience living and studying there during my two years of Master of Arts program. I attended classes, prepared exams and had at least forty five hours of studying during week together with my other classmates. My life at St. Vladimir’s Seminary included also a community assignment every week and on top of that I volunteered many times to host special events, greet strangers and welcome prospective students. “Since I am particularly interested in the area of patristics, I had an honor to work with very reverend Fr. John Behr who was mentoring my MA thesis. I wrote on the topic of ‘The Noetic Anthropology of Gregory of Nyssa in his work De Opificio Hominis.’ I’ve been given an ‘A’ grade for my work on that topic."